THERE is a very good reason why many say the KTM 350 EXC-F could be the perfect enduro motorcycle. It’s fast, light, nimble and straight out of the box it just looks and feels refined. 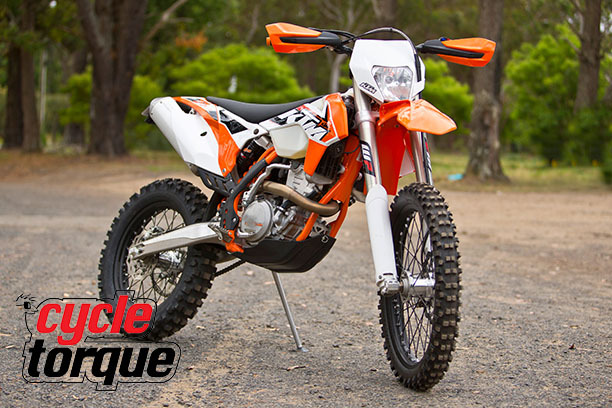 With its versatility and superb riding performance, the KTM 350 EXC four stroke is well suited to riders of all abilities, from your weekend warrior to your die hard off-road racer. The powerful KTM 350cc single cylinder engine delivers smooth and exciting power, complemented with the quality components you would expect from KTM, like Brembo brakes and WP suspension. The frame is built from lightweight high strength chrome-moly steel section tubes, and combine this with a state of the art cast aluminium swingarm and WP PDS rear shock (with 335mm of travel) you have a solid and responsive rear end that can absorb the toughest of terrains. The WP Front suspension is first class, with a pair of USD forks providing a rock hopping 300mm of travel. The bike is fitted with class leading high-tech Brembo brakes, with a 260mm front disc and 220mm at the rear. Aesthetically the 350 EXC-F has some funky new graphics and has the look of the KTM race teams with its orange frame and black rims that are now supplied by Giant. The handlebars, grips and hand-guards have all been improved, and the bike also sports an all-new MAE digital speedo, which is claimed to be easier to read. The engine is forced oil lubricated with two Eaton pumps, and the DOHC (Dual Overhead Cam) cylinder head is equipped with four ultra light titanium valves allowing high engine speeds up to 12,000rpm. The updated DDS clutch basket has been machined from solid high-tensile steel together with the primary drive gear, which reduces weight and improves reliability, the O-rings for the oil pump suction screen have also been improved for better durability under extreme riding conditions. The first thing I noticed when I sat on the KTM 350 EXC-F is how tight and compact the bike felt, the contour of the plastics and design of the bike really suits the rider, you instantly feel as though shifting your body weight around the bike will be easy. The KTM’s fuel injected power delivery is very smooth from idle to full throttle and is very manageable throughout the rev range, it doesn’t have as much low down torque as your bigger bore bikes, but it handles your slower trail riding with ease. Get the revs cranking from the mid range upwards and the KTM releases a smooth and exciting power which makes the bike so much fun to ride. I rode the KTM on a wide variety of terrain and with the adaptability of the engine, the quality of the WP suspension and reassurance of the Brembo brakes, these all combined to instil a confidence that made the riding experience all that much more enjoyable. The WP suspension front and rear is superb and enabled the bike to be controlled effortlessly through the tight bumpy sections, amongst the rocky uphill trails and over the quicker sandy roads. The bike was quick to respond to any sudden changes in direction, and handled everything in its path with ease. The six-speed gearbox is seamless and precise and out of the box is well geared for your slow technical stuff to your fast open trails. 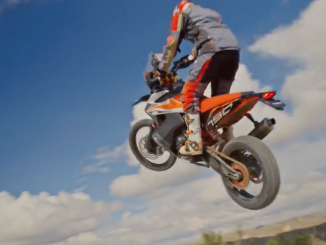 The KTM 350 EXC-F has the versatility to be ridden casually or very aggressively and that is why the 350 EXC-F is such a popular and successful motorcycle on/off the race track. The 350 is the perfect bike for a wide variety of riders and riding conditions. It’s very powerful, but user friendly, light to throw around and responsive to your every move. The hardest thing for me was knowing I had to give the KTM 350 EXC-F back. 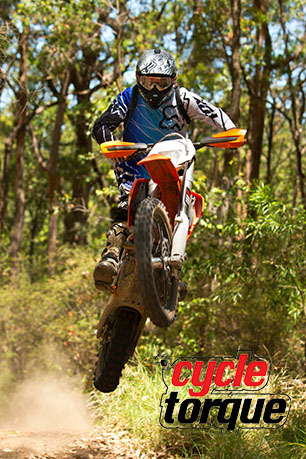 Dave Rose – Former Australian Offroad Champion. I was invited to ride the KTM 350 EXC-F and approached it with an open mind. To just jump on the bike and go, I couldn’t believe how smooth and responsive the engine was, the bike delivers a great amount of manageable power for tight trail riding right through to flat out open trail conditions. As soon as you fire the KTM motor up and you turn the throttle you can feel there is something special about this motorcycle, and you can’t wait to release the power. 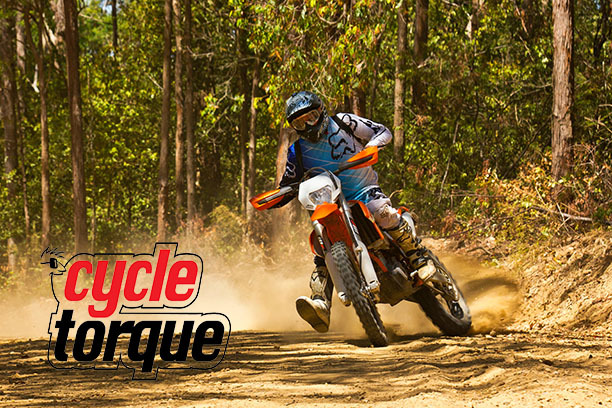 The fuel injected 350cc engine is everything you want from an off-road bike. The WP suspension was very easy to dial in by simply adjusting the clickers at the top and bottom of the forks. I found the suspension a little hard at first for my riding style, but by just backing off the compression and damping to soften it up a bit, this made the bike easier to jump across ruts or quickly change lines. The WP suspension front and rear is really just so forgiving. The brakes are really smooth and solid to use, Brembo brakes have been around for a very long time and you find the big discs on the 350 pull you up with ease no matter what speed you are travelling. I had such a blast riding the KTM 350 EXC-F through the forest on all types of terrain, it really opened my eyes and I believe KTM has produced a great off-road motorcycle which will suit such a wide variety of riders.